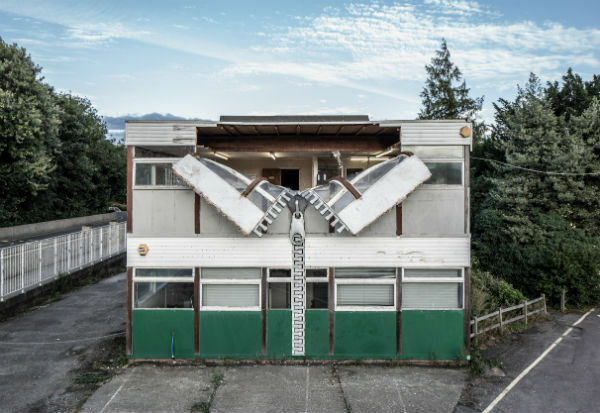 The building which was home to British artist Alex Chinneck’s latest outdoor artwork ‘Open to the public’ comes down this week, but his spectacular piece will live long in the memories, say those behind bringing it to Ashford. The installation appeared overnight in July at Brundrett House in Tannery Lane, on the former Kent Wool Growers site, with Chinneck secretly transforming the disused building into a surreal sculpture. ‘Open to the public’ generated 169 media articles including local, specialist trade, national and international publications and drew in crowds from far and wide to view the ‘unzipped’ building. Over the past five years, the artist has completed a succession of major street sculptures including sliding the brick facade off a three-storey property in Margate; constructing a full-size melting house from 7,500 wax bricks in London Bridge; creating the illusion that a stone building on London’s Covent Garden Piazza was floating in mid-air; and inverting a 37-metre electricity pylon to stand on its tip. The artwork was commissioned by U+I, a specialist regeneration and property developer recognised for creative vision and entrepreneurial flair. It plans to regenerate the brownfield site with a development of new homes, public realm and riverside walkway. U+I also intends to bring Whist House (a Grade II listed building) back into use. The developer is seeking planning approval for 250 new 1, 2 and 3 bed apartments across four buildings, between six and 15 storeys high.